The V&A may be a coming a little late to the video game party, but it’s more than made up for its tardiness with Videogames: Design/Play/Disrupt, a brilliant new show running from now until February 2019. The family-friendly exhibition takes an in-depth look at eight games of the past decade which have shaken up the industry, alongside presenting contemporary arcade games for visitors to play with, and exploring the issues associated with video games. There are now 2.2 billion video game users worldwide, and the exhibition represents as many of them as possible; from casual iPhone gamers to the dedicated players that stay up for days at a time to win League of Legends matches. From the calculated cruelty of Bloodborne to The Graveyard’s endearing elderly protagonist (she's just looking for a bench to sit on), the featured games have been carefully selected to showcase some of the best developers working today. The technology on display is undoubtedly impressive (see the deterministic algorithms that generated 18 quintillion unique planets for 2016’s No Man’s Sky, for example) but it’s the people behind the screens that shine brightest in the show – whether it's the creators or players. 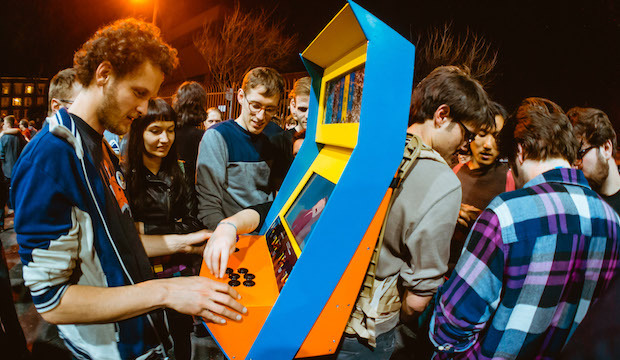 There’s a great section on grassroots gaming, which features arcade games that university students have built into backpacks and stuffed animals with little more than some coding knowledge and a heap of ingenuity. We noticed that sometimes the 'new curatorial language' used to describe the games misses the mark: Minecraft is labelled as 'the Lego of video games', which its developers would probably take issue with. But otherwise this is exactly the kind of thoughtful, intelligent exhibition you’d expect from the V&A on any other art form. This exhibition presents both sides of the metaphor: the nuts and bolts of engineering a game as well as the creative part of the process. Animation models of characters like Ellie from Sony's The Last of Us (2013), whose actions are partly determined by an AI, rub shoulders with Magritte’s Le Blanc Seing (1965), a primary inspiration for the team behind magical realist adventure Kentucky Route Zero (2013). The standout of the arcade is the simplest game in the room: Line Wobbler (2016), created by Robin Baumgarten, is a one-dimensional dungeon adventure. A springy joystick sends a white dot running up a strip of flashing lights, defeating enemies and avoiding lava as it goes. The exhibition offers pure, unadulterated fun, and is a great reminder that for all the billions of dollars that go into designing games each year, sometimes it’s the ones that could be built in your shed that make the most impact on an individual.